Trail Mix | JPMA, Inc. Throw a small baggie of this trail mix into your bag before you leave the house so you'll have something healthy to snack on during the day. 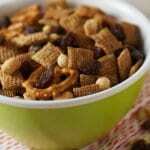 In a large bowl, combine peanuts, raisins, cereal, pretzels, and chocolate chips. Place in an air-tight container or zip-top plastic bag. Store in a cool, dry place. Use any of your favorite nuts or dried fruit in place of the peanuts and raisins. Use any whole grain, low-sugar cereal in place of the crispy whole wheat cereal squares. This snack is high in protein, iron, and fiber. However, it can also be high in calories. Pack ½ - cup portions.